Our first CD in 2018 is titled "The First Time Ever I Lay With You" (label E. P. Collector, catalogue number EPC 2018-15). Now, when majority of Elvis import labels is only re-releasing old stuff in new packages, E. P. Collector label is coming with another surprise! 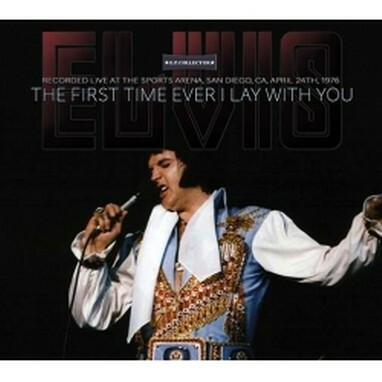 The San Diego, April 24th, 1976 afternoon show is previously unreleased and moreover, it is completely a new show for Elvis fans – never before in circulation, in any form! Elvis April ’76 tour was rated as very good one, with longer shows and variable set list. Unlike later that year, when Elvis ended his concerts quickly after introductions of his band, here he gave no less than 9 songs after „School Day“ orchestra solo! Elvis’ drummer Ronnie Tutt was back in band and pianist Shane Kiester was replaced by Tony Brown. Among the concert highlights there are „Tryin' To Get To You”, „America (The Beautiful)”, „Hurt”, „Burning Love” and „How Great Thou Art”. One song stands out: rare, heartfelt performance of complete version of „The First Time Ever I Saw Your Face”. This song was performed only 3 known times, in 1976. This concert is taken from a recently found first generation copy of an original audience recorded cassette tape. You may ask your supplier for samples. This CD is packaged in a nicely designed digipak with great collection of quality images taken in San Diego, CA, April 24, 1976. If you have enjoyed our other April ’76 tour release called „The Beat Is Back“, then you are sure to enjoy our latest release, too. 01. Also Sprach Zarathustra (2001 Theme) - 02. C. C. Rider - 03. medley: I Got A Woman / Amen - 04. Love Me - 05. If You Love Me (Let Me Know) - 06. You Gave Me A Mountain - 07. All Shook Up - 08. medley: Teddy Bear / Don't Be Cruel - 09. Tryin' To Get To You - 10. America (The Beautiful) – 11. Polk Salad Annie - 12. Band Introductions - 13. What'd I Say - 14. Drum Solo (Ronnie Tutt) - 15. Bass Solo (Blues - Jerry Scheff) - 16. Piano Solo (Tony Brown) - 17. Electric Piano Solo (David Briggs) - 18. School Day - 19. Hurt - 20. And I Love You So - 21. The First Time Ever I Saw Your Face - 22. Burning Love - 23. How Great Thou Art - 24. Funny How Time Slips Away (with false start and reprise) - 25. Little Darlin’ - 26. It's Now Or Never - 27. Can't Help Falling In Love - 28. Closing Vamp.